This classic stick-to-your-ribs stew is ideal on a chilly fall evening. We finally got a good storm that moved through our area and it rained for a solid day. It was grey, chilly and the perfect excuse to whip up one of our favorite comfort foods. 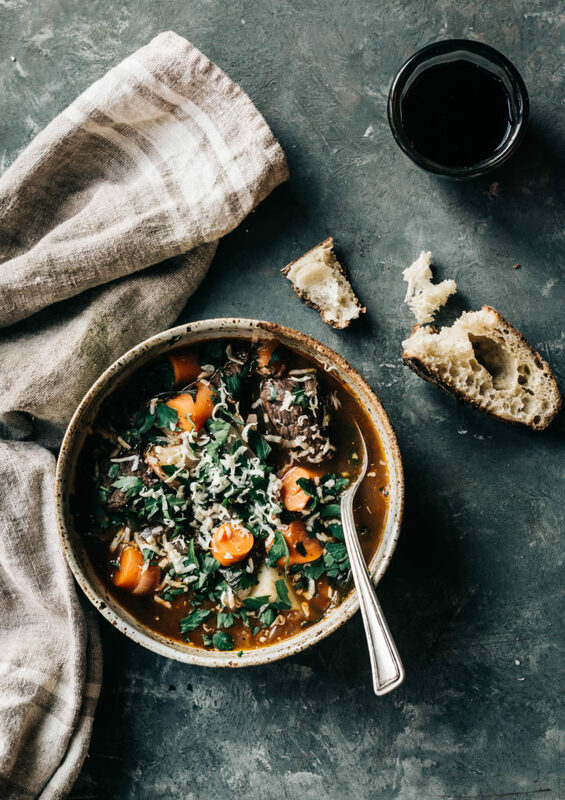 I have a recipe for beef stew in my cookbook that I love but this recipe is a little different and stays in line with our Local Thirty challenge. Everything we sourced came from within 200 miles of Tumbleweed Farm (minus the black pepper) and I think the fresh ingredients made all the difference. So if you plan to whip this up, I think the first stop should be the farmers market to pick up your meat and veggies. Grab some local red wine, and whip up some tomato paste with garden tomatoes (I followed this recipe) serve with some sourdough bread, your favorite dinner date, and a glass of wine for a cozy dinner at home. I hope you all love this stew as much as we do. Cheers to the fall harvest! Place 1/4 cup of the flour, 2 teaspoons salt and 1 teaspoon pepper in a large bowl and whisk to combine. Place the meat in the flour mixture and toss to coat; set it aside. In a large, heavy bottom pot or Dutch oven set over medium heat, add the butter. Shake excess flour off about 1/3 of the meat and add the meat to the pot. Cook, stirring occasionally until it is browned all over, 4-5 minutes. Transfer to a large bowl. Repeat with the remaining meat. Set aside. Add the onion to the pot and season with it with salt and pepper. Cook, stirring occasionally, until it is softened and just starting to brown, about 5 minutes. Add the tomato paste, stirring to coat the mixture and cook for about 1 minute longer. Add the remaining 1 tablespoon of flour to the pot and stir to coat the onion mixture. Pour in the red wine vinegar and the red wine, stir to scrape up any browned bits from the bottom of the pot, and cook until the mixture has thickened, about 3 minutes. Return the meat and any accumulated juiced tin the bowl to the pot. Add the broth, bay leaves, thyme and rosemary. Increase the heat to high and bring to a boil. Immediately reduce the heat to low and simmer, uncovered, for 1.5 hours. Stir in the carrots and potatoes and simmer for an additional 30-40 minutes or until the vegetables are tender but not falling apart. Remove and discard the bay leaves, thyme sprigs and rosemary. Season to taste with salt and pepper. Sprinkle with minced parsley and freshly grated cheese if using. Thank you! I can’t wait to make this over the weekend! Holy smokes! I made this for dinner tonight, and the flavor is just incredible. So delicious and the meat was so tender. This would be a great dish to make to impress your friends. Maybe it’s not so bad that the weather is getting colder starting tomorrow if we can have dinners like this!! Family loved this one!!! My tweak was bacon for the fat. this was great! it had so much flavour after simmering. i replaced the potatoes with mushrooms, but kept everything else the same! thank you! This was not only the best stew I have ever made but one of the best meals. This will be my go to stew forever. Made a double batch today. Lots of rich sauce, rich flavour. Next time I will make cheesey dumplings for it too.